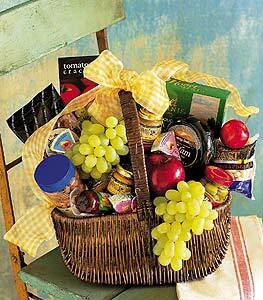 Send this basket filled with delicious fruits and foods, and someone special will enjoy a memorable picnic day. Makes a great corporate gift, too. Fresh fruits, cheeses and crackers arrive in a bow-tied wicker basket. Also includes nuts, sausages, olives and other gourmet items depending on availability. Note: Same day delivery for this item may not be available in all areas.